This article is about Languages of Mexico. For the Indigenous language sometimes called "Mexicano" or "The Mexican language", see Nahuatl. Nahuatl, Yucatec Maya, Zapotec, Mixtec, Mayo, Yaqui, Tzeltal, Tzotzil, Chol, Totonac, Purépecha, Otomi, Mazahua, Mazatec, Chinantec, Mixe, Zoque, Popoluca, Popoloca language, Me'phaa, Wixarika, Chontal, Huave, Pame, Teenek, Kickapoo, Kiliwa, Paipai, Cucapá, Amuzgo, Triqui, Lacandon Maya, Mam Maya, Jakaltek, Matlatzinca, Tepehua, Chichimeca Jonaz, Pima Bajo, Ngiwa, Ixcatec, Ayapanec etc. The government of Mexico uses Spanish for most official purposes, but in terms of legislation, its status is not that of an official primary language. The Law of Linguistic Rights establishes Spanish as one of the country's national languages, along with 63 distinct indigenous languages (from seven large families, plus four counted as language isolates). The law, promulgated in 2003, requires the state to offer all of its services to its indigenous citizens in their mother tongues, but in practice this is not yet the case. Note that, as defined by mutual intelligibility, the number of spoken languages in Mexico is much greater than the 63 national languages, because National Institute of Indigenous Languages (INALI) counts distinct ethnic groups for the purposes of political classification. For instance, the Mixtec are a single ethnicity and therefore count as a single language for governmental/legal purposes, but there are a dozen distinct Mixtec dialect regions, each of which includes at least one variety that is not mutually intelligible with those of the other dialect regions (Josserand, 1983), and Ethnologue counts 52 varieties of Mixtec that require separate literature. Ethnologue currently counts 282 indigenous languages currently spoken in Mexico, plus a number of immigrant languages (Lewis et al. 2018). Due to the long history of marginalization of indigenous groups, most indigenous languages are endangered, with some languages expected to become extinct within years or decades, and others simply having populations that grow slower than the national average. According to the Commission for the Development of Indigenous Peoples (CDI) and National Institute of Indigenous Languages (INALI), while 10–14% of the population identifies as belonging to an indigenous group, around 6% speak an indigenous language. There are other languages not native to Mexico that are spoken in the country. Besides Spanish, the most populous are probably English, German (Plautdietsch), Arabic, Chinese and Japanese. 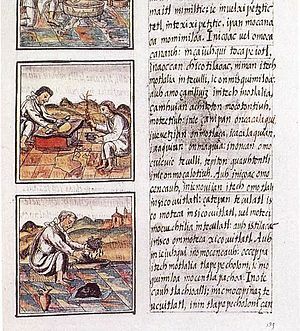 A page of the Florentine Codex written in romanized Nahuatl (Nahuatl is not known to have been a written language prior to its romanization). From the arrival of the first Franciscan missionaries, Spanish, Latin, and indigenous languages played parts in the evangelization of Mexico. Many sixteenth-century churchmen studied indigenous languages in order to instruct native peoples in Christian doctrine. The same men also found Castilian and Latin appropriate in certain contexts. All told, there existed a kind of "linguistic coexistence" from the beginning of the colonial period. Some monks and priests attempted to describe and classify indigenous languages with Spanish. Philip II of Spain decreed in 1570 that Nahuatl become the official language of the colonies of New Spain in order to facilitate communication between the natives of the colonies. In 1696 Charles II reversed that policy and banned the use of any languages other than Spanish throughout New Spain. Beginning in the 18th century, decrees ordering the Hispanization of indigenous populations became more numerous and Mexican colonizers no longer learned the indigenous languages. After the independence the government initiated an educational system with the primary aim of Hispanization of the native populations. This policy was based on the idea that this would help the indigenous peoples become a more integrated part of the new Mexican nation. Except for the Second Mexican Empire, led by the Habsburg Maximilian I, no Mexican government tried to prevent the loss of indigenous languages during the 19th century. In 1889, Antonio García Cubas estimated that 38% of Mexicans spoke an indigenous language, down from 60% in 1820. By the end of the 20th century, this figure had fallen to 6%. For most of the 20th century successive governments denied native tongues the status of valid languages. Indigenous students were forbidden to speak their native languages in school and were often punished for doing so. In 2002, Mexico's constitution was amended to reinforce the nation's pluricultural nature by giving the State the obligation to protect and nurture the expressions of this diversity. On June 14, 1999, the Council of Writers in Indigenous Languages presented Congress with a document entitled "Suggested legal initiatives towards linguistic rights of indigenous peoples and communities", with the goal of beginning to protect the linguistic rights of indigenous communities. The Ley General de Derechos Lingüísticos de los Pueblos Indígenas was passed in March 2003, establishing a framework for the conservation, nurturing and development of indigenous languages. Critics claim that the law's complexity makes enforcement difficult. Spanish is the de facto national language spoken by the vast majority of Mexicans, though it is not defined as an official language in legislation. The second article of the 1917 Constitution defines the country as multicultural, recognizes the right of the indigenous peoples to "preserve and enrich their languages" and promotes "bilingual and intercultural education". In 2003, the Mexican Congress approved the General Law of Linguistic Rights of the Indigenous Peoples, which is a law that is recognizes that Mexico's history makes its indigenous languages, "national languages". Accordingly, they "have the same validity [as Spanish] in their territory, location and context". At the same time, legislators made no specific provisions for the official or legal status of the Spanish language. This law means that indigenous peoples can use their native language in communicating with government officials and request official documents in that language. The Mexican state supports the preservation and promotion of the use of the national languages through the activities of the National Institute of Indigenous Languages. Mexico has about six million citizens who speak indigenous languages. That is the second-largest group in the Americas after Peru. However, a relatively small percentage of Mexico's population speaks an indigenous language compared to other countries in the Americas, such as Guatemala (42.8%), Peru (35%), and even Ecuador (9.4%), Panama (8.3%), Paraguay and Bolivia. The only single indigenous language spoken by more than a million people in Mexico is the Nahuatl language; the other Native American language with a large population of native speakers include Yucatec Maya. According to the Law of Linguistic Rights, Mexico recognizes sixty-two indigenous languages as co-official National languages. With Spanish being the dominant language, Mexico has become a site for endangered languages. "Indigenous people’s disadvantaged socioeconomic status and the pressure of assimilation into mestizo or Ladino society have been influential on indigenous language loss." The result of the conflict between indigenous languages and Spanish has been a language shift in Mexico from indigenous languages being spoken to more people using Spanish in every domain. Due to this situation there have been many different language revitalization strategies put in place in Mexico to try to reverse this language shift. See literature on projects done with the Nahua people  and the experiences of language revitalization in the South of Mexico. Oto-pamean branch: Northern Pame, Southern Pame, Chichimeca Jonaz, Otomí, Mazahua, Matlatzinca and Ocuiltec. Mixtecan branch: Mixtecan languages, Cuicatec and Trique language. Zapotecan branch: Chatino (and its dialects), Zapotec languages. Quichean–Mamean branch: Mam language, Tektitek language, Ixil, K'iche' language, Kaqchikel and Q'eqchi'. The deaf community uses Mexican Sign Language, Yucatan Sign Language, and, in northern Baja California, American Sign Language. The non-indigenous languages spoken in Mexico include English (by English-speaking as well as by the residents of border states). One example of this group is of the American Mormon colony of Nueva Casas Grandes in Chihuahua, which settled in the late 19th century. German (spoken mainly in Mexico City and Puebla), Greek (spoken mainly in Mexico City, Guadalajara and especially in Sinaloa state), Arabic, Venetian (in Chipilo), Italian, French, Occitan, Catalan, Basque, Galician, Asturian, Filipino, Polish, Hebrew, Korean, Ladino, Plautdietsch, Armenian, Japanese, Chinese and other languages are spoken by smaller numbers. Some of these languages (Venetian and Plautdietsch) are spoken in isolated communities or villages. The rest are spoken by immigrants or their descendants who tend to live in the larger cities and towns. As far as second languages go, many educated Mexicans (and those with little education who have immigrated to the US and returned) have different degrees of fluency in English. Many Mexicans working in the tourist industry can speak some English. Romani is spoken by the Mexican Roma. ^ Wasserman-Soler, Daniel (2016). "Lengua de los indios, lengua española: Religious Conversion and the Languages of New Spain, ca. 1520–1585". Church History. 85 (4): 690–723. ^ a b c Suaréz, Jorge A. (1983). The Mesoamerican Indian Languages. Cambridge Language Surveys. Cambridge: Cambridge University Press. ISBN 978-0-521-22834-3. OCLC 8034800. ^ a b Stavenhagen, Rodolfo (1990), "Linguistic Minorities and Language Policy in Latin America: The Case of Mexico", in Florian Coulmas (ed. ), Linguistic Minorities and Literacy: Language Policy Issues in Developing Countries, Mouton Publishers, Berlin, pp. 56–62, at pp. 60–61. ^ Grinevald, Colette. “Endangered Languages of Mexico and Central America”. Language Diversity, Endangered, Matthias Brenzinger. Berlin: Walter de Gruyter GmbH & Co, 2007. 50–86. ^ "Is education destroying indigenous languages in Chiapas?". Hist.umn.edu. Retrieved 2015-12-30. ^ Sánchez, L. (2011), Mexican Indigenous Languages at the Dawn of the Twenty-First Century edited by Margarita Hidalgo. Journal of Sociolinguistics, 15: 422–425. ^ Hamel, Rainer Enrique. “Indigenous Language Policy and Education in Mexico.” Encyclopedia of Language and Education. Vol. 1: Language Policy and Political Issues in Education. 2nd ed. New York: Springer, 2008. 301–313. Gail Virtual Reference Library. Amer. Univ. Bender Library. 5 April 2009. ^ * Instituto Nacional de Lenguas Indígenas [INALI] (14 January 2008). "Catálogo de las lenguas indígenas nacionales: Variantes lingüísticas de México con sus autodenominaciones y referencias geoestadísticas" (PDF online reproduction). Diario Oficial de la Federación (in Spanish). 652 (9). OCLC 46461036. ^ "LEY GENERAL DE DERECHOS LINGÜÍSTICOS DE LOS PUEBLOS INDÍGENAS" (PDF). Archived from the original (PDF) on April 27, 2006. Retrieved February 3, 2006. ^ "PROGRAMA DE REVITALIZACIÓN, FORTALECIMIENTO Y DESARROLLO DE LAS LENGUAS INDÍGENAS NACIONALES : 2008-2012 : PINALI" (PDF). Inali.gob.mx. Retrieved 2015-12-30. ^ "INSTITUTO NACIONAL DE LENGUAS INDIGENAS" (PDF). Inali.gob.mx. Retrieved 2015-12-30. ^ "Información estadística". Archived from the original on November 10, 2005. Retrieved August 11, 2006. ^ Terborg, Roland; Landa, Laura García; Moore, Pauline (2006-11-15). "The Language Situation in Mexico". Current Issues in Language Planning. 7 (4): 415–518. doi:10.2167/cilp109.0. ISSN 1466-4208. ^ Yoshioka, Hirotoshi (2010-01-01). "INDIGENOUS LANGUAGE USAGE AND MAINTENANCE PATTERNS AMONG INDIGENOUS PEOPLE IN THE ERA OF NEOLIBERAL MULTICULTURALISM IN MEXICO AND GUATEMALA". Latin American Research Review. 45 (3): 5–34. JSTOR 40926268. ^ Farfán, José Antonio Flores (2011). "Keeping the fire alive: a decade of language revitalization in Mexico". International Journal of the Sociology of Language. 2011 (212): 189–209. doi:10.1515/ijsl.2011.052. ^ Hernández, Lorena Córdova (2016-02-05). "Consumo literario en lenguas indígenas: experiencias de revitalización desde el Sur de México". Revista CS (in Spanish). 0 (18): 37–61. doi:10.18046/recs.i18.2053. ISSN 2011-0324. Josserand, Judith K (1983). Mixtec Dialect History, PhD Thesis. Tulane University. Lewis, P. M.; Simons, G. F.; Fennig, C. D., eds. (2013). Ethnologue: Languages of the World (16th edition). Dallas, TX (http://www.ethnologue.com): SIL International. ISBN 978-1556712166. This page was last edited on 27 March 2019, at 18:02 (UTC).